Mark Chipperfield reports in The Telegraph on the recent approval by the shire council in Esperance, 460 miles south-west of Perth, of plans to build a full-size replica of Stonehenge. It is hoped that the new attraction will generate tourist revenue for the small coastal community. 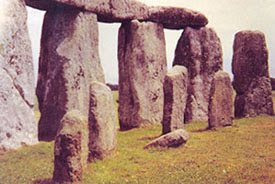 In Stonehenge: How Did The Stones Get There? Aubrey Burl explains how the myth of the stones transported from south Wales to Salisbury Plain arose and why it is wrong. On October 5th, 1789, the first President of the United States George Washington (1732-1799) borrowed two books from the New York Society Library – ‘Law of Nations’, a dissertation on international affairs, and the twelfth volume of the ‘Commons Debates’, a 14-volume collection of debate transcripts from the House of Commons. However, the books were never returned. At today’s prices, adjusted for inflation, the president would face a fine of $300,000 (£195,000). Rich Shapiro reports in the New York Daily News. Ed Pilkington also reports in The Guardian. In George Washington's New Clothes Esmond Wright tells the story of George Washington’s Presidential inauguration. In Aids to Independence Kenneth Baker charts Washington’s victory in the American War of Independence and explores the conflict through caricature and print. At the beginning of the First World War, Brighton’s Royal Pavilion was transformed into a hospital for troops of the Indian Corps wounded on the Western Front in France and Flanders. A new permanent exhibition recently opened at the Royal Pavilion which charts this forgotten chapter of Brighton’s wartime history. At the time, the hospital was heavily mediatised and served as a propaganda tool to recruit soldiers from the subcontinent. The building and its patients were extensively photographed and paintings and a short film were also produced. It is possible to view the collection of photographs from the time on the website of the museum. Maev Kennedy reports in The Guardian. A slideshow of images is available on the website of The Guardian. A team from Southwell Community Archaeology Group excavated the Minster C of E School site between September 2008 and May last year. The results of the excavations have now been published and suggest that the site may have been an important place of worship in Roman Britain. Read the article on the website of Nottinghamshire County Council.